Contrary to what you might think, your kitchen can be organized even though it’s a high traffic area and a drop zone. Clear countertops and tidy storage spaces might be a task you’ve put off and it will take an effort to maintain but it’s worth it. I find cooking is a bit more tolerable when I keep my kitchen as clutter-free as possible. I was taught by my mother at a young age to clean as you go along. This is great advice because it means you’re not left with a big mess to contend with when you’re finished. Clean as you go by wiping down counters, putting away ingredients when you’re done using them and filling the sink with soapy water to quickly hand wash pots, pans and utensils. Create an inviting and usable kitchen by editing your kitchen cabinets and drawers. Strive to edit your storage spaces until every kitchen item has a home. Your counters will be clear and be available for meal preparation when they aren’t needed as supplemental storage for food and cookware. Small appliances used on a daily basis will need permanent homes on your counters. If your kitchen is short on storage options you may want to employ a free-standing shelving unit or store lesser-used items in other areas of your home. Organize your dishes and utensils by setting up cabinet zones or areas for the different categories. You may want zones for each of these categories: baking, pots and pans, serving pieces, tableware, food storage, pantry and seasonings. Grouping items and storing them together will cut down on time spent searching for equipment or ingredients while you’re cooking. Routinely clear your table, counters and wash dishes. Involve the entire family, it’s a team effort! Fifteen minutes a day will save you hours in the long run. 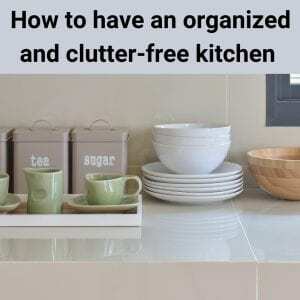 Check out my e-book for more kitchen decluttering and organizing tips, click here.